Eric Rassbach of the Becket Fund writes about NYC’s lawsuit against Hasidic-owned stores in Brooklyn. The city’s lawsuit alleges that the stores’ dress code discriminates against women. CLR Forum covered the story here. New York City residents have lots to worry about. The city’s outstanding debt exceeds $100 billion. The interest alone exceeds $6 billion annually. The city’s tax base continues to shrink as businesses, fed up with New York’s high rates, flee to lower-tax jurisdictions. The city’s infrastructure desperately needs an upgrade. And Hasidic shopkeepers in Brooklyn are engaged in a blatant campaign to violate customers’ human rights. At least that’s what the city’s human rights commission argues. The commission is suing Hasidic shopkeepers who have hung signs in their windows stating, “No shorts, no barefoot, no sleeveless, no low cut neckline allowed in this store.” The commission argues that this dress code discriminates against women in violation of the city’s public accommodations law. According to the deputy commissioner, the signs are “pretty specific to women,” and requiring women to “dress modestly if they come into the store” is illegal. Now, generally speaking, anti-discrimination laws allow public accommodations to have dress codes, as long as the codes don’t discriminate against protected classes. On its face, it’s not clear how this dress code is discriminatory. It treats men and women the same. Let’s say a barefoot woman wearing shorts walks into a store. She may be asked to leave. Let’s say a barefoot man in shorts tries to do the same thing. He also may be asked to leave. Where’s the discrimination? Now, it’s true that the stores might apply a facially neutral dress code in a discriminatory way. So, for example, if the shopkeepers in practice excluded only women, that would be a problem. According to the stores’ lawyer, though, there’s no evidence that the stores have ever excluded any woman–or man, for that matter– for any reason. In short, it’s not clear where the illegality lies. But there’s a deeper point. New York is a cosmopolitan city in which people with very different lifestyles must find some way to get along. Mostly, New Yorkers do that by tolerating things that offend us. That works fine, most of the time. Maybe these religious storeowners should simply put up with dress they find immodest in the interests of a more expressive society. But is it really too much to ask someone to abide by this fairly innocuous dress code before going into a store, if that’s what the store owner wants? Is the injustice really so great that the store owner must be hauled into court and taught a lesson? Aren’t there more important problems for the city to tackle? Sugary soft drinks, for instance. 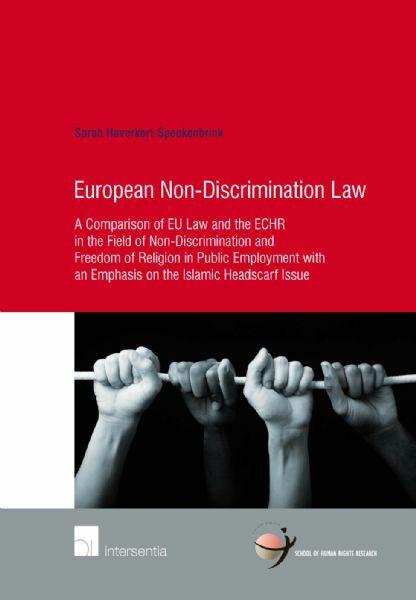 Intersentia Publishing has published European Non-Discrimination Law: A Comparison of EU Law and the ECHR in the Field of Non-Discrimination and Freedom of Religion in Public Employment with an Emphasis on the Islamic Headscarf Issue by Sarah Haverkort-Speekenbrink. The publisher’s description follows.